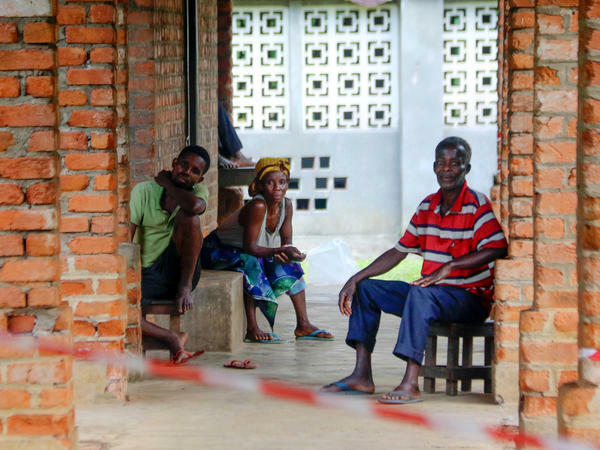 On May 13, people suspected of having the Ebola virus wait at a treatment center in the village of Bikoro, where the outbreak began in the Democratic Republic of the Congo. What's the worse-case Ebola outbreak? Public health officials would say it's when the virus is spreading in a crowded urban environment that's a major transportation hub and has dilapidated, ill-equipped health care facilities. Unfortunately, that's what's happening right now in the northwest of the Democratic Republic of the Congo. Ebola is a virus that causes a severe, and often fatal, illness. The epicenter of this outbreak is in an extremely rural, extremely remote part of the Equateur province. But this week a new patient turned up nearly a hundred miles away in Mbandaka, a city of more than a million on the banks of the Congo River. Peter Salama, the World Health Organization's deputy director general for emergencies, told NPR that the declaration of "urban Ebola" is a major shift in this outbreak. "When you have cases in urban areas, the number of contacts can amplify so much more quickly," he says. "And therefore the increase in the transmission can be much more exponential rather than linear." Mbandaka's location is adding to the concern of health officials. It's a major port on the Congo River. "In a sense, the rivers in northwest DRC are the highways. There are very few paved roads," Salama says. "People use them for transportation so it's quite plausible that the virus could spread down the rivers." The Congo River provides a direct link from Mbandaka to the bustling megacity of Kinshasa, nearly 400 miles downriver, and could also potentially allow the virus to spread throughout central Africa. "That really would be an extremely difficult scenario for us to be able to cope with," Salama says. That's why the World Health Organization along with Congolese officials and other aid agencies are scrambling to try to contain this outbreak before it grows much larger. At a news conference on Friday, WHO officials said the good news is that the number of Ebola cases is not increasing dramatically. Congolese health officials now say there have been 45 suspected cases reported in their country since April. And 25 people have died. Laboratory testing of patient blood samples, however, has been progressing slowly; 14 of the cases have been confirmed as Ebola. Four thousand doses of an experimental Ebola vaccine — which has to be stored at minus 60 degrees Celsius — have shipped to the DRC. Plans are being developed to try to vaccinate hundreds if not thousands in areas near where Ebola cases have been found. Doctors Without Borders is setting up isolation wards and Ebola treatment centers both near the epicenter of the outbreak and in the port city of Mbandaka. The Red Cross is recruiting local volunteers to collect and safely bury the dead. "We have now 20 volunteers trained on how to do these burials," says Karsten Voigt, operations manager for the International Federation of the Red Cross in the Democratic Republic of the Congo. "It's a very difficult task because you have to follow all the security protocols — when you put on your protective gear, when you take it off, the way you handle the body. It is also psychologically demanding because you deal with families who, of course, are in distress." Voigt was just in Bikoro, the remote village where most of the cases have been reported. The Red Cross is also setting up sanitation teams to disinfect houses, clinics and other places that may have been exposed to the virus. Getting supplies to the area is extremely difficult, says Voigt. It took him 11 hours in a four-wheel drive vehicle to cover roughly 75 miles from the nearest airstrip to the village of Bikoro. "It is a very difficult road through the bush. It's a dirt track. The bridges have collapsed," he says. "It's very difficult to reach." Once you get to Bikoro, he says, there are other villages accessible only on foot. To help with the logistical challenges of moving supplies, the U.N. World Food Programme has started flying Russian-made helicopters back and forth from Mbandaka to Bikoro. The WFP has also set up what it's calling an air-bridge for cargo planes between the Congolese capital of Kinshasa and Mbandaka. So far the WFP has moved in 5 tons of personal protective equipment for health workers, tents, body bags and other gear to try to get control of this outbreak before it spreads further. Dr. Robert Steffen, head of WHO's International Health Regulations Emergency Committee on the outbreak, says the local and international response to the outbreak has been swift and robust. International medical teams have already been identified and are on standby to send into the region if the outbreak spreads. He is hopeful that the outbreak will be short-lived: "Given that the outbreak was only confirmed 10 days ago, the immediate response of the Democratic Republic of Congo, the WHO and other partners ... provides a strong reason to believe that this situation can be brought under control."